Under the new owner,this pub is literally changing appearance. From Noon Till Three "TheShakespeare" offers traditional English food and Italian specials, at five starts the Happy Hour with the special offer on cocktails, two for the price of one;you can also enjoy a good glass of Italian wine wrapped in a cozy lounge atmosphere. At half past six the kitchen opens up to 10 pm . The pub offers a vast amount of beers on draft and in bottles as well as a careful selection of whiskies and wines from all over the world.At the bar pizzas and rolls are always available, I really appreciated the friendly owner and the staff. I reccomend it. Not bad really - an okay pub if you're wanting a pint or some bar food in the area. Not worth seeking out or dining at though! Near to the Barbican. I went for lunch at Shakespeare and had a lunch with a drink which was not bad. But when i asked for some salad garnish with my sandwich i was told "you get a drink with it" by the staff very rudely. Its a shame for the rudeness of the staff. 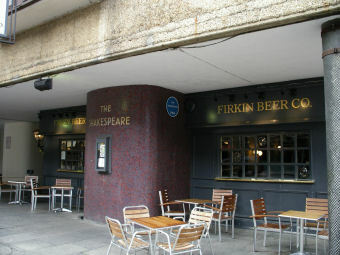 We went in to The Shakespeare in December on the Circle Line pub crawl, and it was okay. The Black Sheep was a little ropey, but the new owner replaced it without a blink, and had a bit of a chat with us. If I recall correctly, he is an Aussie who has never run a pub before and we were there on his second day. So..I'm not going to give a rating as he was a nice bloke and he deserves the benefit of the doubt. I'd be interested to hear how he's doing. This pub, located at the foot of the Barbican complex, certainly doesn't look like much, but I thought it was a bit better than its average rating suggests. It has a large and surprisingly nook-and-crannyish interior, but the overall look is rather clinical and dull. Three handpumps, two dispensing ale, when I visited: Black Sheep and GK IPA. I fancied the latter might be more palatable, and it was fine.